The Greek term for star in the Gospel account, “aster”, can mean any luminous heavenly body, including a comet, meteor, nova, or planet (wandering star). The Chinese have more exact and more complete astronomical records than the Near East, particularly in their tabulations of comets and novae. In 1871, John Williams published his authoritative list of comets derived from Chinese annuals. Comet No. 52 on the Williams list appeared for some seventy days in March-April of 5 B.C. near the constellation Capricorn, and would have been visible in both the Far and Near East. As each night wore on, of course, the comet would seem to have moved westward across the southern sky. The time is also very appropriate. This could indeed have been the wise men’s astral marker. Comet No. 53 on the Williams list is a tailless comet, which could well have been a nova, as Williams admitted. No. 53 appeared in March-April of 4 B.C.-a year after its predecessor – in the area of the constellation Aquila, which was also visible all over the East. 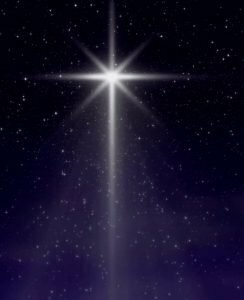 Was this, perhaps the star that reappeared to the Magi once Herod had directed them to Bethlehem in Matthew 2:9? Comets do not display all the characteristics described in the full Nativity story. A planet or planets seems more likely. In ancient astrology, the giant planet Jupiter was styled the “King’s Planet”, for it represented the highest god and ruler of the universe: Marduk to the Babylonians; Zeus to the Greeks; Jupiter to the Romans. The ringed planet Saturn was deemed the shield or defender of Palestine, while the constellation of Pisces, which was also associated with Syria and Palestine, represented epochal events and crises. So Jupiter encountering Saturn in the sign of the Fishes would have meant that a divine and cosmic ruler was to appear in Palestine at a culmination of history. Meanwhile, new research on the star based on recently available astronomy software and historical research on Josephus’ manuscripts is being conducted and collected at www.bethlehemstar.net.